1) How the freezing ocean water numbed your legs and made them look like purple popsicles—even in August. 2) That I had the coolest counselor who attended Kenyon College, so of course I wanted to go to school there and be cool like her until my mom told me she wouldn't come visit me in Ohio (true story). 3) And how every single morning we were roused from our bunks by Depeche Mode's "Just Can't Get Enough" blaring throughout the camp. You'd think I would hate that song now after being subjected to it over and over and over again like a form of torture, but to this day whenever I hear that song a big smile comes over me and I find myself jumping up and wanting to do a little Molly Ringwald dance (The Breakfast Club style). I just can't get enough of "Just Can't Get Enough!" And that is precisely the way I feel about summertime peaches! Which makes sense now that the American Bureau of Peaches has me on their payroll. Well, they don't really but they should because I am out there praising and pushing peaches to everyone I see. They're just so sweet and juicy right now. I don't want anyone to miss out on this seasonal delight. That probably explains why they can't seem to be kept out of any dish or drink I make right now. Take this salad I made for a party a few weeks ago. 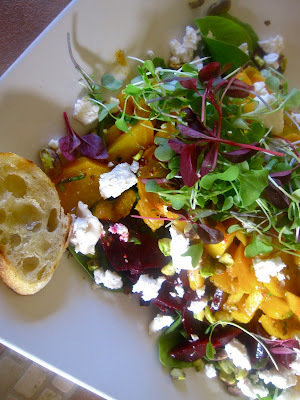 I was asked to bring a beet salad but in truth have grown a little tired of the omnipresent roasted beet salad. I thought for a bit the kale salad might eclipse it, but the beet salad doesn't seem ready to relinquish its crown anytime soon. 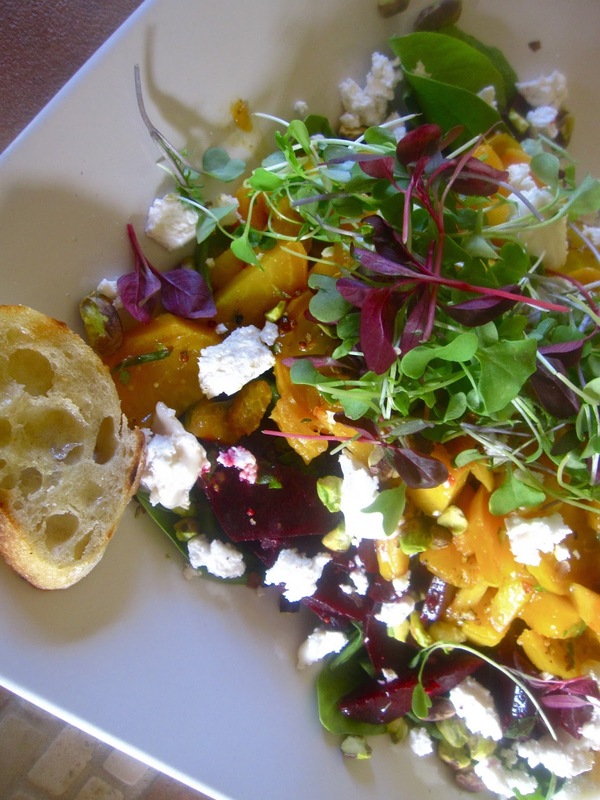 Probably because it's really tasty and satisfying, especially when you add goat cheese, toasted pistachios, tangerines, and a tarragon vinaigrette to it. Oh and did I mention that adding peaches just catapults it to the next level of enjoyment? Cuz it does. While I know some people feel like everything is better with bacon, I'm officially changing to the "everything is better with peaches" team. We may be small but we're strong. And because I split my time with the "everything tastes better with bread" team, I would encourage you to also try this beet-peach ("beach?") salad as a crostini. All I can say is get on the peaches, people! Your time is running out! 1. Cut greens from beets and wrap in aluminum foil. Roast in 400 degree oven for approximately 1 hour (depending on how large the beets are). 2. Unwrap beets carefully to let steam escape. When cool enough to handle, cut stems off and peel beets. You may want to use gloves because beets can leave your hands and fingernails red—for quite a while. Slice beets. I like them in half coins but you can do wedges—whatever you like. 3. Whisk the Dijon, vinegar, tarragon, salt, pepper and olive oil together. Tweak as needed (more salt and pepper, a drizzle of honey, etc.). 4. Peel and slice tangerines and peaches and add to the beets. Toss with some of the vinaigrette and Italian parsley. 5. Place arugula on the bottom of a platter. Top with beet mixture and then sprinkle crumbled goat cheese and pistachios on top. "Dust" with microgreens and serve! 6. If you want to make this into a crostini, just slice and grill a baguette and serve along side the salad. How funny! I am venturing into the world of beets...and googled beets and found the link to this...i recognize your name....you are friends with the strongs!! Glad I stumbled upon your blog...love it!! !